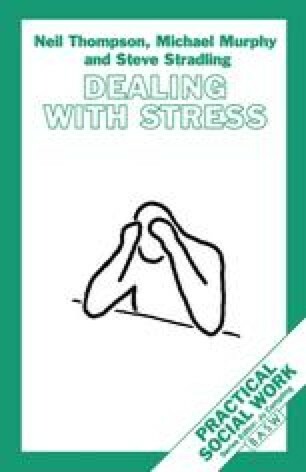 One thing this book has, we hope, made clear is that dealing with stress is not a simple or straightforward matter. The issues are subtle and intricate, the demands upon us complex and often intense. One implication of this is that there is a very strong need for clear and relatively simple guidance as to how to deal with these matters. This chapter, then, plays a dual role. On the one hand, it acts as a traditional final chapter with a focus on summarising the main issues and drawing the book to a logical close. On the other hand, however, it is also intended as a guide and reference point, a resource to assist social work staff in rising to the stress challenge. As a consequence of this dual role, the exposition is something of a hybrid, involving a mixture of conventional text and a range of charts and diagrams to act as a practical guide.